Marijuana may still be illegal, but anyone who takes a trip around Rhode Island may notice the increasing number of stores that sell items commonly used in part with the drug. As of 2013 in the state of Rhode Island, marijuana has been decriminalized to the extent that anything less than one ounce found within one’s possession is considered a civil offense with zero jail time and a maximum fine of $150. Anything over one ounce to one kilogram for personal use is treated as a misdemeanor with one year of jail time and/or a fine of up to, but not exceeding $500. Sale, intent to distribute and cultivation are still treated as felonies with varying degrees of jail time and much larger fines. While the popularity of head shops, glass shops, smoke shops and other establishments that sell recreational drug paraphernalia have lead to a significant spike in profits, there are still some controversies regarding the legality of it all. In fact, the sale of drug paraphernalia is a crime here in Rhode Island, so how do these shops avoid problems with the law? There are certain liability issues the shops take care to avoid to stay in business. Because of Rhode Island law, minors cannot purchase any pipes just as they may not purchase tobacco. Everything sold within these shops is intended solely for the use of tobacco, hookah and shisha, however, customers tend to purchase them to use as devices for smoking marijuana instead. This leads to a gray area, but is not reflected on the actual store as long as they do not condone the customers’ intended usage of marijuana. In the event that legal trouble is brought back to store owners by police, they are not considered responsible because of precautions taken to protect themselves. Many stores post age restrictions and signs that explicitly say products are only for tobacco use to discourage wrongful purchases. While stores may need to post signage and inform all clientele that everything within the shop is to be used for tobacco smoking to keep in accordance of the law, there has to be some sort of realization that not everyone buying a four foot bong is smoking something legal. It is against the law to outright purchase a bowl for smoking marijuana. However, buying a tobacco pipe is legal, so many people take advantage of this clause. This is how tobacco smoke shops stay relevant. Either way, these shops make a large profit from sales regardless of how the customer intends to use the product. Sales also depend on location. 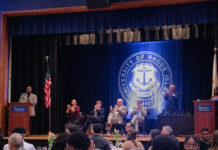 The University of Rhode Island is a partially dry campus, meaning drug and alcohol consumption and usage is strictly banned and such behavior is not condoned regardless of age (check this out for more details). URI is only partially dry because the severity of punishment for such offenses is not nearly as rigorous as some dry campuses in the United States. This is why it is rather ironic that there are three smoke shops on top of campus, each located within the Kingston Emporium. The stores on campus, Absolut Market and Smoke Shop, Rhode Island Glass Shop, better known as RIGS Smoke Shop and Shades of Sunderland Tattoo Body Piercing & Smoke Shop all do very well for themselves as one might expect from the clientele on campus. The stores sell legal materials intended for tobacco smoking though many students on campus use them differently. The selection of glass pieces in each of the stores is quite extravagant. This mindset that the shop owners wipe their hands of the responsibility after sales is what keeps these shops away from legal disputes. Signs are posted that say “for tobacco use only.” Some follow what they preach better than others, however. For instance, Absolut Market and Smoke Shop has cases of bowls labeled tobacco use only, but has an entire rack of varying sweatshirts and tees that say “legalize.” This shows that there are some discrepancies. While some owners admit to knowing a majority of their sales are purchased for not tobacco usage, others express that everything they do is with the interest of the law in mind. Bill Sunderland, of Shades of Sunderland Tattoo said he takes pride in his work and that if someone enters the store with any inclination that they might be trying to use a purchase for something other than tobacco they will be declined and asked to leave the store. Usage aside, the quality of glass provided in these shops varies, as do the prices. Absolut sticks to mostly local glass, importing some pieces, but staying away from glass imported from China as it often contains lead. RIGS mostly specializes in local glass and has cases separated by price so shoppers can always find something within their budget. Smoke shops in general are an increasing industry and while many customers purchase the legal paraphernalia for illegal uses, the business are able to stay out of trouble because they state the legal intended use of their products. According to every smoke shop on campus they have no affiliation, but ask anyone smoking marijuana on campus where they got their bowl and they’d tell you the same exact shop. Also read: Types of alcoholics and their symptoms.